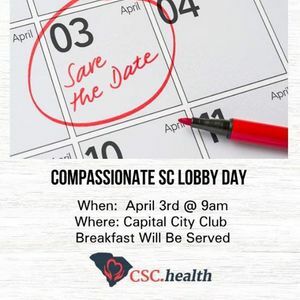 Do you want to make a difference for patients in the state of South Carolina? Join together with CSC.health, our patient advocacy non-profit, to affect our state laws. After a hearty breakfast, the morning will be packed full of informative speakers and useful information presented by our team of professionals. 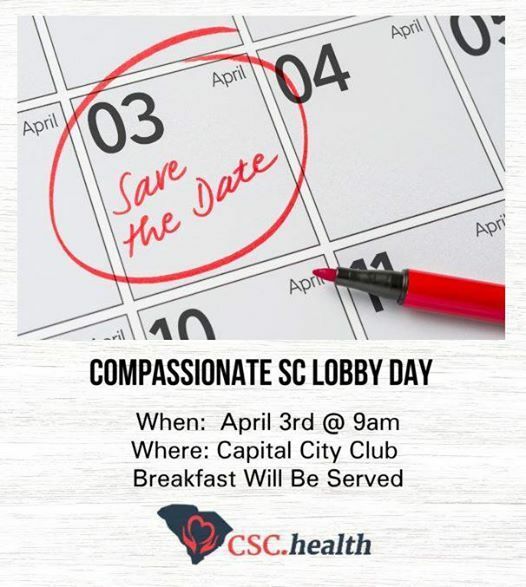 Senator Tom Davis, sponsor of S366 the Compassionate Care Act, will join us and discuss the progress of the bill and address specifications and amendments that were adopted. Abbey Roudebush, Esq., Senior Manager, Government Relations & Advocacy for the Epilepsy Foundation is joining us and sharing insights on the Foundation’s priorities as well as the progress they are making throughout the country. Heather Breeden, Senior Manager of Advocacy for the National Multiple Sclerosis Society will convey why they support the bill. Heather Johnson, our CSC Lobbyist, will provide the educational portion of the morning session. This will include practical information on ways to approach and interact effectively with your legislators. Our participants will be broken down into smaller groups based on your home districts. We will then walk over to the statehouse to connect with your legislators either by appointment or meeting them briefly in the lobby. Join us for a "hands-on approach" to learn how the legislative process works and be part of a driving force to affect patients' quality of life for the better! The event is complimentary but space is limited, so do not delay!